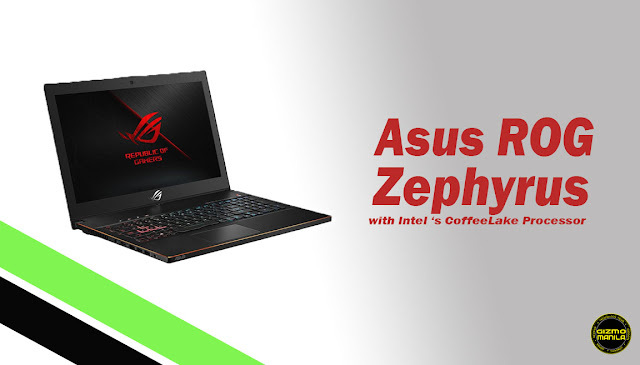 Home / asus / gaming / gaming laptop / rog / zephyrus / The ROG Zephyrus is powered by Intel's CoffeeLake Processors. The ROG Zephyrus is powered by Intel's CoffeeLake Processors. The New ROG Zephyrus GX501 is still the world’s thinnest gaming laptop with a GTX1080 graphics card and more. Featuring the ROG Aerodynamic Active System (AAS), the GX501 is able to maintain the power of Intel’s most powerful CPUs and a discrete GTX1080 under great temperatures. This year, ROG takes the GX501 a step further by harnessing the power of Intel’s Hexa-Core Core i7-8850H and upgrades the display to an ultra-fast 144 Hz refresh rate IPS panel with G-sync. It’s the world’s most powerful Ultrabook. The Zephyrus can be configured with an 8th Generation Intel Core i7-8850 Hexa-Core Processor, 2TB HDD and 512gb PCIEx4 Nvme SSD, 32GB DDR4 Ram and a 144Hz IPS Panel with G-Sync. The I/O ports are complete with HDMI 2.0, USB Type C with Thunderbolt, Multi USB 3.1 type A ports and the usual Headphone/Headset/Microphone jack. For complete details of ROG Zephyrus laptop Click Here.